Genome sequences of seven well-studied ant species give researchers a detailed look at molecular mechanisms - including what may be a basis for complex behavioral differences in two worker castes in the Florida carpenter ant, Camponotus floridanus - basically, epigenetics. Epigenetics is the study of how the expression or suppression of particular genes by chemical modifications affects an organism's physical characteristics, development, and behavior; if that sounds vague or perhaps even Lamarckian, your confusion is understandable. It is believed that epigenetic processes play a significant role in many diseases and are also involved in longevity and aging. Extrapolating epigenetics, some even go so far as to blame a student's college academic performance on diet - the father's, before conception. You really can blame everything on your parents. But in simpler creatures with complex-seeming caste systems, epigenetics is more rigorous. A group found that epigenetic regulation is key to distinguishing one caste, the "majors", as brawny Amazons of the carpenter ant colony, compared to the "minors", their smaller, brainier sisters. These two castes have the same genes, but strikingly distinct behaviors and shape. Ants, as well as termites and some bees and wasps, are eusocial species that organize themselves into rigid caste-based societies, or colonies, in which only one queen and a small contingent of male ants are usually fertile and reproduce. The rest of a colony is composed of functionally sterile females that are divided into worker castes that perform specialized roles such as foragers, soldiers, and caretakers. 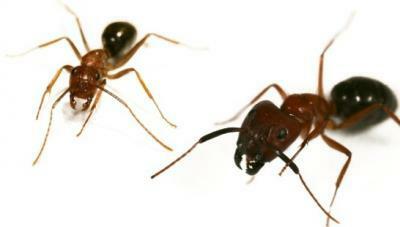 In Camponotus floridanus, there are two worker castes that are physically and behaviorally different, yet genetically very similar. Lead author Daniel F. Simola, PhD, a postdoctoral researcher at Penn, explains that "the major is also called a soldier, and it has a much larger head, so the force of its mandibles can break larger prey. It does more nest and colony defense." The minor caste, on the other hand, is smaller and more numerous. "They do most of the nursing within a colony, take care of the young, and they will also go out and collect most of the food," says Simola. "On average, 75 to 80 percent of the foraging activity is done by the minors." The minor also has a considerably shorter lifespan than the major caste, making the ant castes a good model for longevity studies as well as behavioral studies. But how do such marked differences arise when both the major and the minor castes share the same genome? "For all intents and purposes, those two castes are identical when it comes to their gene sequences," notes senior author Shelley Berger, PhD, professor of Cell and Developmental Biology at Penn. "The two castes are a perfect situation to understand how epigenetics, how regulation 'above' genes, plays a role in establishing these dramatic differences in a whole organism." To understand how caste differences arise, the team examined the role of modifications of histones (protein complexes around which DNA strands are wrapped in a cell's nucleus) throughout the Camponotus floridanus genome, producing the first genome-wide epigenetic maps of genome structure in a social insect. Histones can be altered by the addition of small chemical groups, which affect the expression of genes. Therefore, specific histone modifications can create dramatic differences between genetically similar individuals, such as the physical and behavioral differences between ant castes. "These chemical modifications of histones alter how compact the genome is in a certain region," Simola explains. "Certain modifications allow DNA to open up more, and some of them to close DNA more. This, in turn, affects how genes get expressed, or turned on, to make proteins. These modifications establish specific features of different tissues within an individual, so we asked whether there are also overall differences in histone modifications between the brawny majors and the brainy minors that might alter specific features of the whole organism, such as behavior." In examining several different histone modifications, the team found a number of distinct differences between the major and minor castes. Simola states that the most notable modification, "both discriminates the two castes from each other and correlates well with the expression levels of different genes between the castes. And if you look at which genes are being expressed between these two castes, these genes correspond very nicely to the brainy versus brawny idea. In the majors we find that genes that are involved in muscle development are expressed at a higher level, whereas in the minors, many genes involved in brain development and neurotransmission are expressed at a higher level." These changes in histone modifications between ant castes are likely caused by a regulator gene, called CBP, that has "already been implicated in aspects of learning and behavior by genetic studies in mice and in certain human diseases," Berger says. "The idea is that the same CBP regulator and histone modification are involved in a learned behavior in ants – foraging – mainly in the brainy minor caste, to establish a pattern of gene regulation that leads to neuronal patterning for figuring out where food is and being able to bring the food back to the nest." Simola notes that "we know from mouse studies that if you inactivate or delete the CBP regulator, it actually leads to significant learning deficits in addition to craniofacial muscular malformations. So from mammalian studies, it's clear this is an important protein involved in learning and memory." These findings have established the crucial role of genome structure in general, and histone modifications in particular, in determining the acquisition of organism-level characteristics in ant castes. The research team is looking ahead to expand the work by manipulating the expression of the CBP regulator in ants to observe effects on caste development and behavior. They also hope to refine the technique of mapping histone modifications so that specific tissues, such as a brain from a single ant, can be analyzed, rather than using pooled samples, as in the current study. Berger observes that all of the genes known to be major epigenetic regulators in mammals are conserved in ants, which makes them "a fantastic model for studying behavior and longevity. Ants provide an extraordinary opportunity to explore and understand the epigenetic processes that underlie many human diseases and the aging process."